In 2017, PWN Lisbon reinforced its strategic role model, networking and training initiatives in relevant areas to career building, leadership and talent consolidation, addressing a variety of subjects, featuring many prestigious coaches. 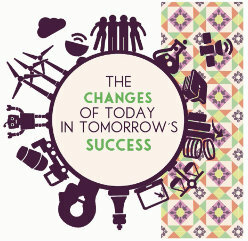 The theme for our 2017 annual event: "The changes of today in tomorrow's success". A great video of the days proceedings was created to share with you a feel for the enormous amount of energy generated at the event. You can watch it here! Milo Jones, Alexandra Abreu Loureiro, Armando Marques Guedes, Rogério Carapuça, Ana Sofia Silveira, Paula Panarra, Rogério Canhoto and Maria João Carioca gave voice to two large panels with moderations assured by Joana Gaivão and Henrique Monteiro at the event that had the last message from the PWN Global President, Sonya Richardson. In the different panels, the event integrated this group of prestigious national and international personalities who, with their charisma and their career example, contributed to a healthy, deep and credible reflection of the most prominent leadership angles. Among the main factors of change were the soft skills, the worldliness, the empathy, as fundamental and very relevant for the construction of a future of success, sustainable and solid. In a direct link to the theme of the event, the various assumptions of the leadership strategies listed were framed in the field of geopolitics. In this analysis of the evolution of leadership and its relevance in organizations, systemic and structuring factors, such as geography, climate, culture, demography or technology, and the interaction among them, as determinants for the creation of long-term value. The 6th edition of PWN Lisbon's annual event deserved the consensus of the women and men present, whether in numbers – it was full house in Sociedade Nacional de Belas Artes – or in the quality of interventions from the audience, punctuating with pertinence and originality the discussion conducted by the speakers. It was a hymn to diversity. Next year there's more!